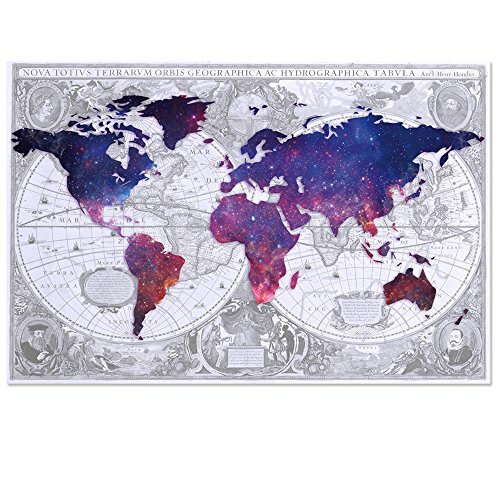 Map Canvas Wall Art,Giclee artwork,Eco-ink resolution, printed on water-proof canvas. Stretched and Framed, Ready to Hang.Gallery wrapped on 1" wood bars.More Strong Threedimensional Appeal,More Stable,and Better Quality. Size:48"x32"(120x80cm),Great pieces to liven up and energize any wall or room. Any problems,please contact us,we treasure your purchase experience much.And due to different brand of monitors, actual wall art colors may be slightly different from the product image. Designart PT6548-271 4 Panel "Board Stained Art Abstract" Canvas Art Print, Orange, 48x28"
The Oliver Gal Artist Co. 'Abstract Elegance' Canvas Art, 36"x42"